Action Against Hunger, in partnership with the United Nations Office for the Coordination of Humanitarian Affairs (OCHA), launched a new intervention in December to support at-risk Syrian refugees in Jordan—and Jordanians themselves—to cope with severe weather conditions this winter. The needs are tremendous. An estimated nine million Syrians have fled their homes since civil war broke out in March 2011. With the fifth anniversary of the crisis looming next month, Syrian families are struggling through another harsh winter. Some 2,240 refugees and 960 Jordanians are benefiting from our cash assistance efforts in the region this year. We provide a stipend to families to help cover needed winter items—that way, they are empowered to use their existing and limited resources to meet other basic needs for rent and food. This new program benefits families in Irbid, which hosts Jordan’s second-largest share of refugees living outside of a camp environment (143,448 people, or 23 percent of refugees). Irbid is characterized by a high ratio of Syrians to Jordanians (13 percent), with 26.7 percent of the population currently at risk of falling into poverty. We are delivering humanitarian assistance to these families through several channels—providing cash, distributing ATM cards, and providing gas heaters. Our program enables the most vulnerable families, who have significantly limited resources, to stay warm during the winter months while continuing to meet their other basic needs. Assessments that we, and other humanitarian workers, have conducted in the area indicate that refugee households and vulnerable Jordanian households are not able to generate enough income to pay for adequate heating and other necessary items, like warm clothing and outerwear, to cope with the cold. These expenses strain the resources of families already struggling to meet their needs for food, water, and shelter. 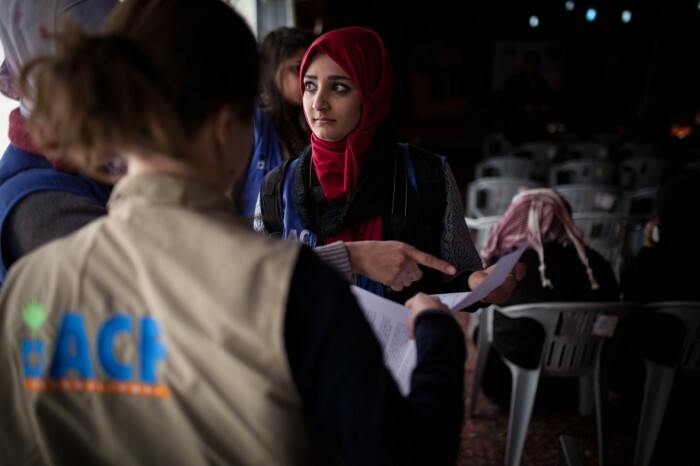 Fatima, a 24-year-old Syrian refugee from Dara’a, explained how the assistance from Action Against Hunger would allow her to buy winter clothes for her children and pay her rent. She is also working on reducing some of the debt that hangs over her family. Arnaud Phipps, our Country Director in Jordan, warns that many families in the region are resorting to dangerous measures just to get by. Our cash assistance program is designed to help at-risk families survive the difficult winter. When spring arrives, we will still be where we are most needed, helping Syrian refugees and host communities in Jordan to recover from this crisis.